The two most cited reasons ... having your voice heard on key local issues and being able to serve the community. 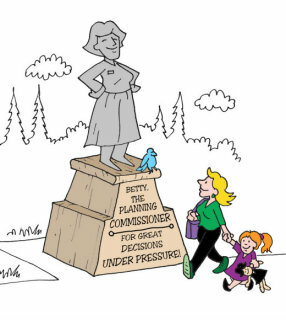 Why do people want to serve on their local planning commission? 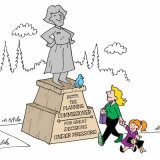 What were the top three reasons you were interested in serving on your planning commission? 1. Have a Voice in Decision Making. Ninety-nine of the 186 individuals who replied to this question -- 53 percent -- listed as one of their reasons for being interested in serving on the planning commission a desire to have a voice in decision making. 2. Serve the Community. Not far behind as a reason was the desire to serve their community. A total of 82 individuals -- 44 percent -- mentioned this as one of their top three reasons for wanting to be on the planning commission. 3. Relevant Expertise. Listed by 31 percent of our respondents as (at least) one of their three top reasons for being interested in serving on the planning commission. 4. Interest in Planning, Land Use, or Local Government. This was mentioned by 17 percent of those replying to the question. 5. Learning Opportunities. Noted by 12 percent of those who replied. Note: total is greater than 100% as respondents were asked to list up to 3 reasons for their interest in serving on their planning commission. In a country where local democracy is treasured, it’s essential that citizens play an active role in their community — and local planning commissions offer an important opportunity for this. It was good to hear that public service is still a major reason individuals want to devote many (often unpaid) hours to planning commission service. At the same time, it's understandable that many also view the commission as a place where they can have input on local decisionmaking. In a country where local democracy is treasured, it's essential that citizens play an active role in their community -- and local planning commissions offer an important opportunity for this. But, as you'll see in a coming post, many of our survey respondents reported a lack of racial, ethnic, or gender diversity on their commission. As we noted in the Summary, 99 individuals (53 percent of those replying to the question) listed as one of their reasons for being interested in serving on the planning commission a desire to have a voice in decision making. Of these 99 replies, 52 mentioned something fairly specific they wanted to accomplish, while the remaining 47 noted a more general desire to be involved in decision making. Provide a progressive, environmentally concerned perspective. "Wanted to increase bike and ped options, get rec paths on public and conserved land, where compatible with natural resource goals." "To help bring economic development to the forefront." "Provide a progressive, environmentally concerned perspective." "To stop the direction of a Mayor with personal agendas." "To improve the quality of development"
"I'm interested in preserving the character of residential neighborhoods." "Ensure that the regs are clear, fair, and consistent." "Try to insure managed growth." "Have a say on future development plans." "Having a voice in local issues." "Have a 'seat at the table'." "Wanted to make a difference." "Participating in decisionmaking in advance." "Want to have a say in my community." Forty-four percent of those replying to this question indicated as one of their reasons for wanting to be on the commission a desire to serve their community. "Wanted to give back to the community at large / serve." "Give back to my community." "Provide service to my community." There was very little variation in the replies that fell into this category. Words like "serve," "give back," and "contribute" were found in the vast majority of responses we placed in this category. 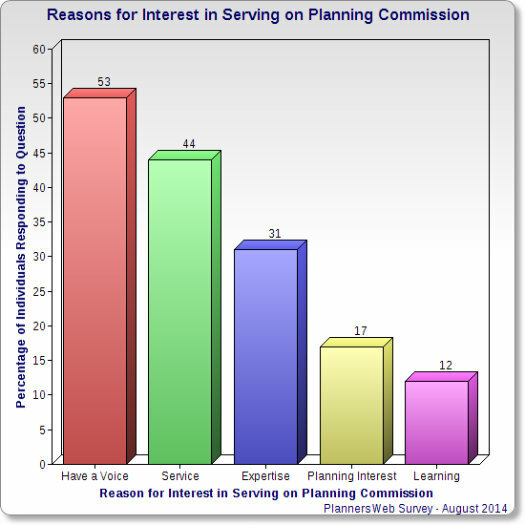 Thirty-one percent -- 57 individuals -- listed as one of their top reasons for wanting to serve on the planning commission their expertise or relevant experience. Of these, 15 noted that they had a background as either a planner or as an academic involved with planning. Being a retired builder I had some knowledge of what the problems are. "Background as Architect / Planner." "Bring my engineering expertise to the commission." "As a planner, I wanted to see what sitting on the other side of the table was like." "Had worked in planning and economic development-related associations." "Being a retired builder I had some knowledge of what the problems are." "Was a professional traffic engineer (retired)." Of the 186 individuals replying to the question, 17 percent mentioned as a motivating factor their having an interest in planning, land use, or local government. "To understand the planning process." "Interest in land planning in general." "I'm interested in local government issues." "Lifelong interest in urban planning." "I've been interested in city government since high school." "Care about local land use issues." Twelve percent of those replying noted learning opportunities as one of their reasons for being interested in serving on the planning commission. We included in "learning opportunities" replies that mentioned a desire to stay current with what was going on in the community. Great learning experience in many dimensions, including "people perspectives." "Staying current with community issues." "To find out what was going on in the city." "To know and understand the issues of the county." "To learn more about the specifics of planning & zoning in the context of our community." "Great learning experience in many dimensions, including 'people perspectives'." Not surprisingly, there were quite a few reasons given by individuals for wanting to serve on a planning commission -- many did not fit into the categories we just described. "Own a large amount of land in the jurisdiction." "Was encouraged by past PC members." "I was retired and had time to dedicate to the position." "Associate with interesting people who serve as staff and commission members." "I am a woman and it was an all male commission at the time so I felt my contribution as a woman might be worthwhile." "Associating with good people with like concerns." "I responded to the Mayor's request to serve." A couple of other responses also caught our eye -- including one from an Ohio board member (we trust with a sense of humor) who wanted to serve in order to help the commission "become a better looking group"! We were also struck by the comment from a Missouri commissioner who noted as one reason for wanting to serve the "non-elective nature of public service." This comment reminded us that planning commissions can offer an opportunity for talented individuals -- who may be reluctant to run for office -- to serve their community. Note: as we report in another post, 95 percent of those who replied to our survey said they were appointed, not elected, to their planning commission. While many who serve on planning commissions are drawn by related experiences or expertise, it was interesting to hear from a Virginia planning commissioner that part of the attraction was that it required "reaching outside my comfort zone." Finally, one commissioner from California gave as a reason for wanting to serve: "I'm a glutton for punishment!" We'll attribute that comment to having completed our survey right after a long, contentious commission hearing!